On the afternoon of June 9, 2006, an explosion on a northern Gaza beach killed seven members of the Ghalya family and wounded dozens more Palestinian civilians.237 The IDF, many journalists, and human rights organizations, including Human Rights Watch researchers who were in Gaza the next day, conducted inquiries into the incident.238 Human Rights Watch has called for an independent investigation of the incident.239 This chapter lays out the findings of Human Rights Watchs research and its reasons for concluding that an Israeli artillery shell caused the explosion.
. I opened it, put my daughters inside [on the back seat]. When searching [our] stuff, I found I was missing my cell phone. I went back to where I was sitting and didnt find it. It took about two minutes. Then the shell that killed the Ghalyas exploded. I found pieces of people scattered. I found my car damaged, penetrated by shrapnel. I looked at my daughters and found them screaming, with blood from the back and the front, Azanin said. He drove the car until the engine died several kilometers away. He then loaded his children into an ambulance and went to the Kamal `Udwan Hospital in Beit Lahiya.247 Doctors extracted shrapnel from the girls during surgery. we left the car behind, we left our cell phones, and ran away, Abu Rabia said.248 He ran holding the hands of his sons Ahmad, 15, and Harun, 11. When the shell that killed the Ghalyas exploded, he was about 20 meters away. Ahmad suffered injuries to his right foot, leg, and abdomen.249 His wife Nada said she saw their 19-year-old son Mahmud, fall to the ground. He saw his intestines coming out and started holding them. He asked, What shall I do? she said. God brought a man with a cart and horse to carry my son.250 She loaded him on the cart and they all set off for the hospital. Meanwhile Abu Rabias eldest son, 25-year-old Khamsa, went back to find his crying siblings. Both injured boys returned home from the hospital within six days after the explosion; Mahmud remained bedridden. Although the IDF acknowledges it was firing artillery in the area that day, it takes the position (see below) that the explosion responsible for killing the Ghalya family on June 9 was not an artillery shell that Israel fired that day and was probably not an IDF artillery shell at all. After investigating the incident, however, as described below, Human Rights Watch concluded that the deadly explosion was caused by a 155mm Israeli artillery shell. The shrapnel, crater, and injuries all point to this weapon as the cause. Three scenarios could explain the shells explosion on the beach that afternoon. First, it could have been a live shell that exploded on the beach as it struck. Second, it could have been an unexploded artillery shell fired earlier that lay in the sand before being detonated by the reverberations of nearby shelling that afternoonthe IDF had shelled the beach area on previous occasions. These two scenarios are the most likely because of the nature of the injuries and the fact that the IDF acknowledges that it shelled other parts of the beach that day. A third hypothesis, advanced by the IDF, is that Palestinian militants may have taken an unexploded IDF shell they found elsewhere and rigged it up as an improvised explosive device (IED) that then exploded, with fatal consequences, on June 9. The IDF suggested that militants might have placed an IED on the beach in order to thwart an IDF landing from the sea.256 Major General Kalifi did not suggest, however, why the Palestinians might fear an amphibious landing when the IDF has unrestricted access across the 51 kilometer Israel/Gaza land border. The nature of the injuries casts further doubt on the IED explanation. The shrapnel from the incident that Human Rights Watch examined in Gaza points to a 155mm artillery shell as the source of the blast that killed the seven Ghalya family members. Human Rights Watch examined shrapnel from four sources. First, it found an approximately 15-centimeter piece of shrapnel near a crater on the beach itself. It was stamped 155mm. The fact that it had not yet oxidized indicated that it was fresh and not from an earlier attack. A week later, the shell fragment had begun to oxidize. Second, Human Rights Watch found a small copper shell fragment deep in the back of the front seat of Hani Azanins car. The explosion on the beach that killed the Ghalyas had seriously damaged the vehicle. The blast blew out its windows, and shrapnel pierced the trunk and doors. Fragments that penetrated the car left holes in the seats. By the time Human Rights Watch talked to Hani Azanin, three days after the incident, he had cleaned the car of human flesh and most of the shrapnel.257 The copper fragment found by Human Rights Watch definitely came from the blast that killed the Ghalyas because this was the blast that caused all the damage to the Azanin car. In all likelihood it came from the copper ring of an artillery shell. Finally, the explosive ordnance disposal (EOD) team of the Palestinian police found dozens of pieces of shrapnel in the crater of the explosion that killed the Ghalyas. From our experience and analysis, the [shell fragments] we found belong to 155mm Israeli artillery. It is used by artillery every day in northern Gaza, said Gen. Salah Abu `Azum, head of the EOD team.259 He and his staff had matched up each fragment with a part of a 155mm shell. For comparison, General Abu `Azum also showed Human Rights Watch Qassam-type rocket fragments, which are visibly much thinner. The EOD team, which was trained in the United States and Europe, indicated it had a high level of familiarity with these and other types of munitions. The crater of the fatal explosion supports the view that a 155mm artillery shell caused the blast. Human Rights Watch examined the crater, as well as two other fresh craters, during its investigation of the beach the day after the attack. It was about 1.5 meters in diameter, the same size as older craters from previous IDF shelling of the beach, and only slightly shallower than those found at the sites of other artillery strikes on soil, probably due to the compactable sand. The crater also had a powder in it consistent with that found in craters caused by 155mm artillery shells. While the powder in the many old craters in the area had grayed over time, the powder in the crater of June 9 was bright white, indicating its freshness. If an unexploded shell from a previous incident caused the explosion, the crater would likely have been similar. The location of the injuries also provides a clue to their cause. Doctors reported multiple injuries to the abdomen, arms, and head. There were also some leg injuries, but these were minor. This suggests the injuries were not caused by an IED. An artillery shell, when set off perpendicular (or close to perpendicular) to the ground releases a cone of explosion that travels upwards.262 This cone causes primarily upper body injuries. An unexploded shell from a previous incident, depending on its angle of impact, would also probably be perpendicular. This pattern strongly suggests that the shell was not used as part of an IED, which would most likely be buried horizontally because it is easier to roll a shell into a shallow hole than dig a much deeper hole and lower it in. If we want to assume a kid played [with an IED], he [including his lower body] would have been torn to pieces. Where is that child? No one was shattered into pieces [that way], said EOD chief General Abu `Azum.263 An IED would cause lower body injuries even if it were triggered by the IDF artillery barrage further down the beach that day. The IDF suggested that if artillery fragments were found, this could be because Palestinian armed groups made an IED using an old artillery shell. While Palestinian armed groups are known to make and use IEDs, the Palestinian EOD team said they had never seen one made out of such a shell.264 The IDF did not indicate that it knew of any precedent for this sort of Palestinian IED, on the beach or anywhere. In addition, it would be unusual to have an isolated IED buried in the sand given the extremely unlikely prospect of an Israeli sea invasion. The timing of the explosion also supports the conclusion that the blast was caused directly by Israeli artillery shelling, either from that day or from an unexploded shell fired earlier and set off by the impact of the shelling that day. It is also consistent with the theory that Israeli artillery shelling set off a Palestinian IED, but as mentioned above, there is no plausible reason for a Palestinian armed group to place such a weapon on the beach. Maj. Gen. Meir Kalifi, head of the IDFs investigative team, reported that the IDF fired six artillery shells plus two naval shells at a beach in northern Gaza between 4:31 and 4:50 p.m.265 According to hospital log books, the first patient arrived at Kamal `Udwan Hospital at 5:05 p.m. Given that it takes about twenty minutes to drive from the hospital to the beach and back, the blast likely occurred within the timeframe of the Israeli shelling. Digital data supports this chronology. The hospital usually runs hematology tests shortly after a patient arrives. A computerized printout of a blood test for one of the Azanin girls reports that her test took place at 16:12 (or 4:12 p.m.).266 Surprised by the fact that this preceded any reported shelling of the beach, Human Rights Watch re-visited the hospital and discovered that the staff had not adjusted that machine to reflect daylight savings time. Thus there is written and digital evidence that the Azanin girl had arrived at the hospital between 5:05 and 5:12 p.m. The times of admittance and the blood test indicate that the fatal blast occurred during the time of the Israeli shelling that day. Major General Kalifi, the investigative team leader, told Human Rights Watch that based on ballistic analysis, surveillance videos, and shrapnel, he concluded that an Israeli shell launched that afternoon could not have caused the explosion. He said, Without any doubt and absolutely no question it could not have been the result of artillery fired on that day. Information until now negates the result of artillery fire.270 Kalifi made clear that this conclusion was based exclusively on information assembled by the IDF and excluded all evidence from other sources, including Human Rights Watch.271 He argued first that another type of weapon killed the civilians on the beach. When presented with Human Rights Watchs evidence during an interview, however, he modified his hypothesis and conceded that the cause of the blast may have been a 155mm shell, but then argued that Palestinians may have placed it there as an IED or that it was a dud Israeli shell that was set off by the IDF barrage that afternoon. Kalifi said that the IDF fired more than 80 shells in the general vicinity but outside the specific beach area on the morning of June 9. It fired an additional six 155mm shells and two 76mm naval shells at what he characterized as a known rocket launch site at the beach between 4:31 and 4:50 p.m. At a distance of 300 meters from the family was a launching ground commonly used for launching Qassams, he said. Those areas are targeted while Qassams are being fired from them as well as in a situation [in which] we receive advance information they will be used. International humanitarian experts who monitor security developments in Gaza told Human Rights Watch that there were two sites in the beach area that Palestinian armed groups have used to fire rockets, one about 500 meters and the other about one kilometer from where the Ghalyas were killed.272 While there is no specific rule saying how close armed forces can place military objects to civilian areas, the launching of rockets 300 meters from a popular Palestinian beach, if true, suggests that the armed groups may not have taken all feasible precautions to protect the civilian population. This would also be the case if the launch site were 500 meters from an area frequented by civilians. Major General Kalifi said the IDF fired a shell at an area 600 meters away from the fatal blast to calibrate the artillery. Because IDF radar did not detect this first shell, the same artillery piece fired another shell of the same type towards the same target. According to Khalfi, another two shells were then fired with the same gun and data. These second, third, and fourth shells landed within 60 meters of each other, he said. The same M109 artillery piece fired the fifth and sixth shells at a different target. Kalifi said these last two shells landed 200 meters away from the fatal blast. This meant, he said, that the chance that their shrapnel could have injured the civilians was one in a thousand or in ten thousand. As noted earlier, the lethal radius of a 155mm shell is between 50 and 150 meters and the injury radius between 100 and 300 meters. That still leaves the first 155mm artillery shell, the one that Kalifi said the radar failed to detect. According to the IDFs calculations, he said, the statistical probability that this first shell was the fatal one was one in a billion. He did not explain to Human Rights Watch the IDFs methodology for reaching this conclusion. His explanation also does not account for witness testimony that the first shell was not the fatal one. Several IDF surveillance videos were the second main source the IDF presented to support its version of the incident. The IDF publicized three videos of the beach, all of which Human Rights Watch viewed. The first video, which Major General Kalifi said was filmed from a gunship from 4:54 to 4:57 p.m., showed no excitement in behavior...no signs of panic. Kalifi said the evident calm showed that the Israeli shells fired between 4:31 and 4:50 had not caused the incident. The second video, from a different surveillance camera, he said, showed a convoy of vehicles arriving at 5:15 p.m. Kalifi said these were ambulances, suggesting that the explosion occurred sometime after the last Israeli shell explodedaccording to him, at 4:50 p.m. The third video, from a third camera, shows a lot of activity at the beach at 5:30 p.m., which Kalifi attributed to the chaos of the explosion. If this were the case, it would indicate that the explosion had taken place well after the last Israeli shell of that afternoon had landed. All of the video evidence is fuzzy and difficult to interpret, but other hypotheses are possible. For example, the beach could have been empty at the time of the first clip because people had fled to the parking lot; the convoy of vehicles in the second video could have been journalists and Palestinian police, who raced to the scene after the incident; and the chaos of the third video could have been the journalists who flocked to the scene after the explosion. The IDF also did not release the video of the whole time period, including the alleged time of the blast. The availability of significant evidence that the IDF has not examined or taken into account casts serious doubt on its conclusions and underscores the need for an independent investigation of the incident. 237 The body of an eighth person, Muhammad Yusif Junaid, subsequently washed up near the beach, and initial reports suggested that Junaid was also killed by the same blast. According to the Palestine Monitoring Group, a body affiliated with the Negotiations Affairs Department of the PA, Junaid had been frightened by Israeli naval attacks and threw himself into the sea, where he drowned. See Palestine Monitoring Group, Daily Situation Report, 11 June 200612 June 2006, p. 10. 238 See, for example, Donald Macintyre, Fresh Doubts Cast on Gaza Report, Independent, June 18, 2006; Stephen Farrell, Israel Admits Shell Report Flaws, Times (London), June 17, 2006. 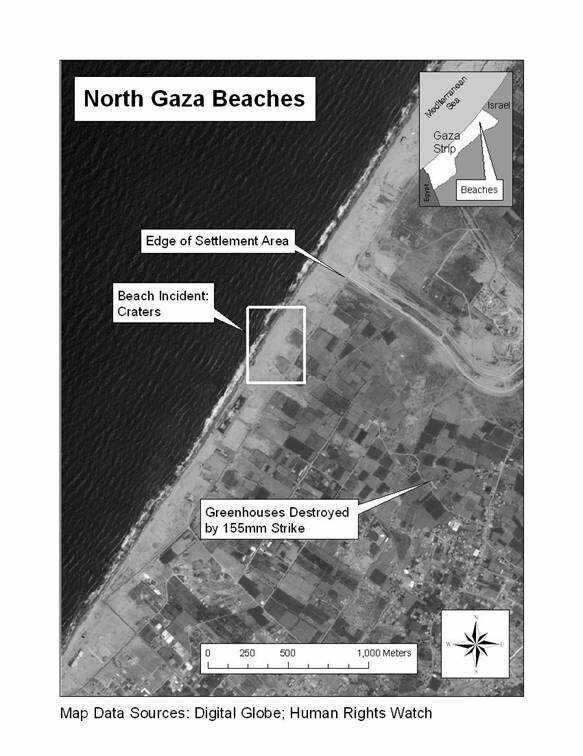 239 Israel: Investigate Gaza Beach Killings, Human Rights Watch news release, https://hrw.org/english/docs/2006/06/13/isrlpa13544.htm, June 13, 2006. 240 Human Rights Watch interview with Hamdia Ghalya, `Ali `Isa Ghalyas second wife, Gaza City, June 11, 2006. 241 Human Rights Watch interview with Ayham Ghalya, 17, Beit Lahiya, June 12, 2006. 242 Human Rights Watch interview with Huda Ghalya, 11, Beit Lahiya, June 12, 2006. 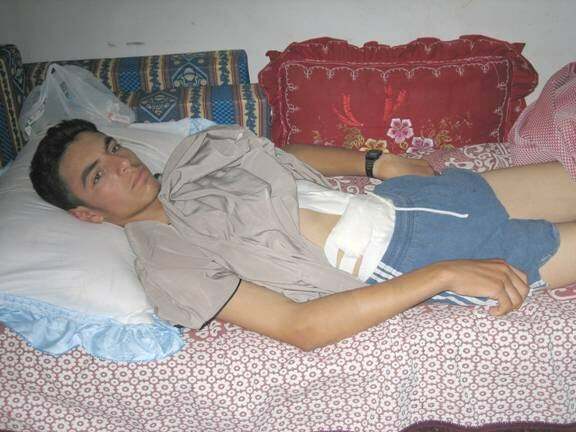 243 Human Rights Watch interview with Ayham Ghalya, 17, Beit Lahiya, June 12, 2006. 244 The 12-year-old son of Ramadan Ghalya (`Ali `Isa Ghalyas brother) lost both his legs when the IDF shelled a family strawberry field on January 4, 2005, according to Ramadan Ghalya. See the appeal for financial assistance on behalf of the family at http://ghaliafamily.brinkster.net/ (accessed on October 25, 2006). 245 Human Rights Watch interview with Dr. Jum`a al-Saqqa, director of Public Affairs, Shifa Hospital, Gaza City, June 11, 2006. 246 Human Rights Watch interview with Dr. Nabil al-Shawa, Shifa Hospital, Gaza City, June 11, 2006. 247 Human Rights Watch interview with Hani Radwan Azanin, 31, taxi driver, Beit Hanoun, June 12, 2006. 248 Human Rights Watch interview with Sayid Abu Rabia, 46, construction worker, Beit Lahiya, June 15, 2006. 250 Human Rights Watch interview with Nada Abu Rabia, Beit Lahiya, June 15, 2006. 251 Human Rights Watch interview with Muhammad Sawarka, Gaza beach, June 10, 2006. 253 Human Rights Watch interview with Maj. Gen. Meir Kalifi, deputy commander of Ground Forces Headquarters and head of the investigative committee for the beach incident, IDF, Tel Aviv, June 19, 2006. Other IDF sources said the time were 4:30 and 4:51 p.m., but the discrepancy does not change the analysis. See, for example, Major General Gallant: I Will Not Forfeit the Security of Civilians, IDF press release, June 12, 2006, http://www1.idf.il/DOVER/site/mainpage.asp?sl=EN&id=7&docid=53142&Pos=1&last=0&bScope=False (accessed July 31, 2006). 254 Human Rights Watch interview with Sayid Abu Rabia, 46, construction worker, Beit Lahiya, June 15, 2006. 255 Human Rights Watch interview with Isma`il Ghanim, 20, worker, Beit Lahiya, June 15, 2006. 256 Human Rights Watch interview with Maj. Gen. Meir Kalifi, deputy commander of Ground Forces Headquarters and head of the investigative committee for the beach incident, IDF, Tel Aviv, June 19, 2006. 257 Human Rights Watch interview with Hani Radwan Azanin, 31, taxi driver, Beit Hanoun, June 12, 2006. 258 Human Rights Watch interview with Sayid Abu Rabia, 46, construction worker, Beit Lahiya, June 15, 2006. 259 Human Rights Watch interview with Gen. Salah Abu `Azum, commander, Palestinian Explosive Ordnance Disposal (EOD) team, Gaza City, June 13, 2006. 260 Human Rights Watch interview with Dr. Nabil al-Shawa, Shifa Hospital, Gaza City, June 11, 2006. 261 Human Rights Watch interview with Dr. Mousba Hodar, Shifa Hospital, Gaza City, June 11, 2006. 262 [F]or the idealised case of an airburst shell falling perpendicular to the ground, it can be visualised as a wide-angled cone with the shells final position at the apex of the cone. Lt. Col. P.R. Courtney-Green, Ammunition for the Land Battle (London: Brasseys Limited, 1991), p. 21. 263 Human Rights Watch interview with Gen. Salah Abu `Azum, commander, Palestinian Explosive Ordnance Disposal (EOD) team, Gaza City, June 14, 2006. 265 Human Rights Watch interview with Maj. Gen. Meir Kalifi, deputy commander of Ground Forces Headquarters and head of the investigative committee for the beach incident, IDF, Tel Aviv, June 19, 2006. Other IDF sources said the times were 4:30 and 4:51 p.m., but this discrepancy does not change the analysis. See, for example, Major General Gallant: I Will Not Forfeit the Security of Civilians, IDF press release, June 12, 2006, http://www1.idf.il/DOVER/site/mainpage.asp?sl=EN&id=7&docid=53142&Pos=1&last=0&bScope=False (accessed July 31, 2006). 266 Ministry of Health, Laboratory of Shahid Kamal `Udwan Hospital, Hematology Department, CD1700 Specimen Data Report, analyzed June 9, 2006, 16:12, obtained by Human Rights Watch from the hospital on June 15, 2006. 267 In Regards to the Incident on the Gaza Beach, IDF press release, June 9, 2006, https://www1.idf.il/DOVER/site/mainpage.asp?sl=EN&id=7&docid=53106&Pos=39&last=0&bScople=False (accessed July 31, 2006). 268 Chief of General Staff: We Are Making Every Effort Not to Harm the Innocent, IDF press release, June 11, 2006, http://www1.idf.il/DOVER/site/mainpage.asp?sl=EN&id=7&docid=53128&Pos=1&last=0&bScope=False (accessed August 1, 2006). 269 Minister of Defense: Facts Confirm Incident Not Caused by Israeli Actions, IDF press release, June 14, 2006, http://www1.idf.il/DOVER/site/mainpage.asp?sl=EN&id=7&docid=53169&Pos=1&last=0&bScope=False (accessed July 31, 2006). 270 Human Rights Watch interview with Maj. Gen. Meir Kalifi, deputy commander of Ground Forces Headquarters and head of the investigative committee for the beach incident, IDF, Tel Aviv, June 19, 2006. Unless otherwise indicated, all information in this section comes from this interview. 271 The IDF spokespersons office informed Human Rights Watch in an email sent on December 2, 2006 that Maj. Gen. Kalifis investigation was not yet formally completed because its conclusions had yet to be presented to all relevant members of the General Staff. 272 Human Rights Watch interviews (names withheld), Gaza Strip, June 11 2006, and subsequent e-mail exchanges. 273 Inquiry Committee Established into Gaza Incident, IDF press release, June 11, 2006, http://www.mfa.gov.il/MFA/Government/Communiques/2006/Inquiry+committee+established+into+Gaza+incident+11-Jun-2006.htm (accessed February 23, 2007). 275 Letter to Kahlil Abu Shamala, director, Institute of Conscience for Human Rights, from Dr. Rafiq al-Husaini, Office of the President, National Palestinian Authority, Palestinian Liberation Organization, June 15, 2006. 276 Human Rights Watch interview with Ghazi Hamad, PA spokesman, Gaza City, June 12, 2006. 277 Steven Erlanger and Ian Fisher, Israel Missiles Kill 10 in Gaza, New York Times, June 14, 2006.